Sagesse has had a very healthy well rounded start to her career. She was started in a very relaxed and thorough program, since then she has spent quite a bit of time being ridden in a very natural setting including hills and creeks. Sagesse traveled to Aiken in winter of ’17; she attending various xc schoolings and facilities. This mare is talented and fancy but with the fabulous sturdy quality of the New Forest Pony. 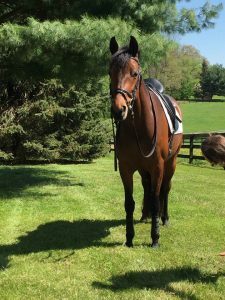 Sagesse has great potential as an eventer, dressage or jumper pony.